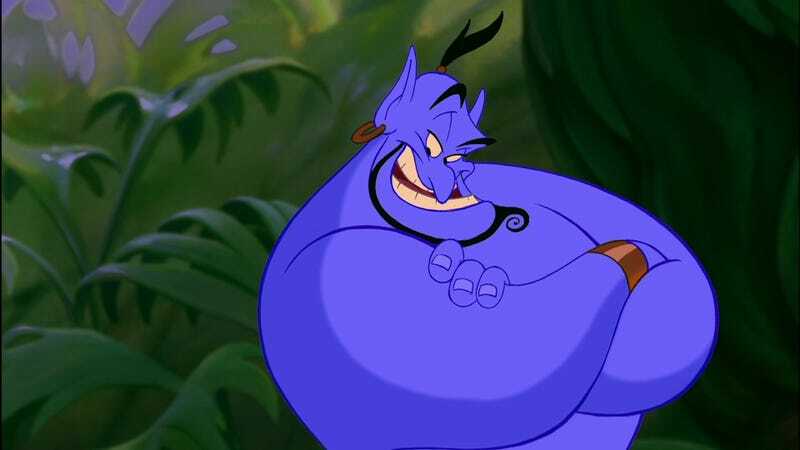 When you watched Aladdin as a kid, did you ever think, “I wonder where the genie came from?” If you did A) That’s a little weird but B) You may just get your answer. Disney is reportedly developing a live-action Aladdin prequel, focusing on the world of genies. Oh, and it gets better/worse—depending on your point of view. This film would tell the story of how the genie from Aladdin became e a genie and got trapped in the lamp, potentially leading to a live-action remake of Aladdin itself. If everything goes to plan. This film, currently called Genies, is being written by Damian Shannon and Mark Swift. They’re the team behind Freddy vs. Jason, the 2009 Friday the 13th remake, and they also recently worked on the Baywatch film, which will star Dwayne Johnson. All three of those projects (two of which we’ve seen and one we can only guess at) are very tongue-in-cheek. They know what they are, and that alone doesn’t want to make me want to side with Jafar just yet. If Shannon and Swift can bring a knowing, smart tone to this film, then maybe it stands a chance. Then again you can’t say you didn’t see this coming. Disney has been making billions with live action remakes of their classic animated films like Alice in Wonderland, Maleficent and Cinderella. There are also more on the way: Beauty and the Beast, for example, is currently in production as well as an Alice sequel, The Jungle Book and more. Until people stop coming to these films, they’re just going to keep making them.